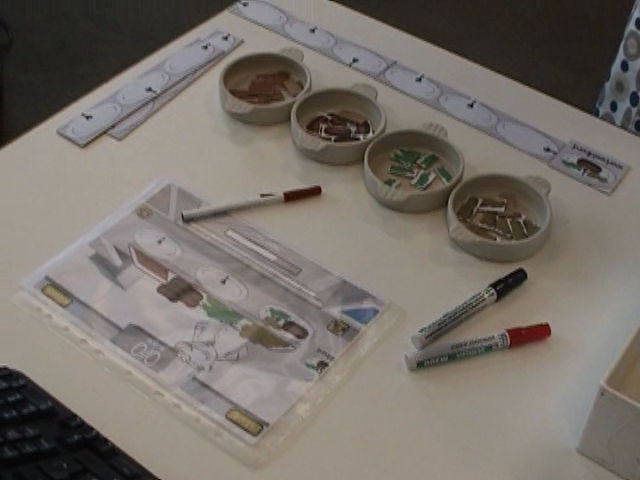 Paper prototyping is one of the most helpful methods for designing a game. It allows you to improve and test your designs extremely fast, as long as you know what you are doing. My colleague Vero Vanden Abeele and I were asked to help e-learning developer Opikanoba with the conceptual design of some simple web-based training games for one of their clients. The game would be about preparing food using proper hygiene precautions. We ended up doing a bunch of prototypes for them. For example, one of the a prototypes was about grilling steaks in rapid succession. The main mechanic for this game was timing and resource management. Some of the fictional customers in the game wanted their steaks to be rare, others wanted them well done, and so on. To prototype this, we used tiny handheld firework sticks and a small aquarium to dip the lighted sticks in when the player felt that a steak was done. The moderator would then compare the burned length with a scale to see if the player was right or not. Using this prototype we managed to fine-tune the complexity of the game (e.g. the amount of steaks that were to be baked at the same time), get a relative timer set up correctly, compare the results and responses of different player types, and so on.